BMW's F1 M12 in America. 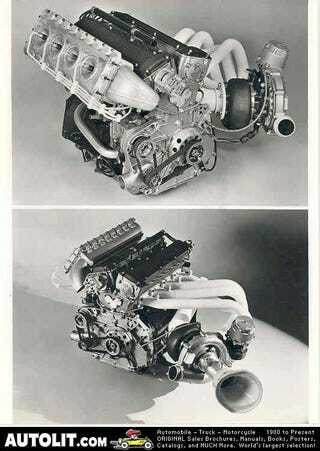 Always loved the herculean stories of the M12's massive power from F1. Running on WW2 Luftwaffe fuel and Tolulene/paint-thinner mix to get that 1500hp qualifying hand grenade engine to work. Here it is in IMSA GTP trim. 2 liters instead of 1.5, running on more normalized gas. that extra half liter restores most of the power lost. 800@9,000 rpm, 1,400 for qualifying. If GTP racing wasn’t more of an endurance length, it might have had a chance. All kinds of electrical and fuel problems. BMW couldn’t keep this or the BT55 F1 car together all year. But I still love engine candy.